The largest national park in the United States, everything about Wrangell-Saint Elias National Park is big. For starters, it encompasses 13 million acres of land, a glacier the size of Rhode Island and the fourth largest peak on the continent. Nine of the 16 highest peaks in the nation are in the park, and there’s much more tucked into this giant. 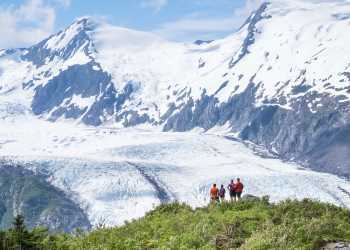 Malaspina Glacier covers more than 1,000 square miles, making it a dominant feature and a gem for mountaineers, ice climbers and backcountry hikers. Kennicott Guides offers day and overnight guided hiking and packrafting trips, as well as ice climbing for all experience levels. The park is filled with history. The old town of Kennecott is a well-preserved example of a mining boomtown. Rich copper deposits brought miners north in the early 20th century, and the iconic red buildings of the mill and surrounding town site still stand. Kennicott Glacier Lodge and the nearby town of McCarthy make a convenient starting point for a day of exploration in the park.